I'm in New York today, and for the next few days, to attend Book Expo America. BEA is a trade show for publishers, booksellers, and librarians. For book lovers it is heaven on earth! Over 600 authors will be signing copies of their books. The chance to pick up free copies of books and other promotional materials. A look at new and forthcoming titles. Sorry you can't all join me, but I'd suggest attending the Friends' Strawberry Festival and Book fair this Saturday. You'll find lots of great books! And yummy treats. And who knows, maybe a hottie or two! Forty years ago, on June 2, 1967, the Beatles released Sgt. 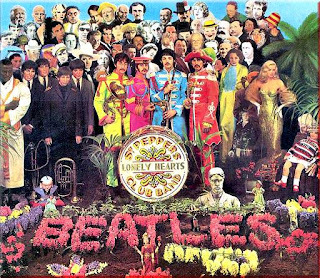 Pepper's Lonely Hearts Club Band [CD ROCK BEA]. It is recognized as the first "concept" album. So what else happened 40 years ago? The Country Music Hall of Fame opened in Nashville. (Look for Will the Circle be Unbroken: Country Music in America [781.642 WIL]. How many of the people depicted on the cover can you name? I heard an interesting BBC report this morning about The Big Donor Show being shown on Dutch television. This reality show will televise the decision of a terminally ill woman who will choose a kidney donor from a field of three. Supposedly the show will highlight the need for more donors in the Netherlands. As you might imagine, the show has spurred much controversy, especially since the viewing audience may text message their opinions! I found a book called Controversies in the Practice of Medicine by Myra Chandler Goldstein [362.1 GOL] that devotes a chapter to "Organ Donation." The chapter mentions Nicholas Green, a boy, whose tragic kidnapping and death, led to multiple organ donations. The complete story of Nicholas is covered by his father, Reg Green, in The Nicholas Effect: a Boy's Gift to the World [362.1783 GRE]. Not to make light of the topic of donations, but, it has become the topic of several works of fiction, most notably, My Sister's Keeper by Jodi Picoult [F PIC also in audio AB/CD PIC]. My Sister's Keeper deals with the ethical dilemma of conceiving a child for the express purpose of providing a donor for a sick sibling. Picoult's novel has the donor sister, now a young teen, choosing to take her parents to court to prevent them from continuing to use her body. This complex and moving story has become a wildly popular book discussion group choice! For today, I won't direct you to anything in our collection, but I thought you might find this article about Arlington National Cemetery of interest. Most people as they age, begin to realize that good health is one of the most important things to strive for. Unfortunately, with the increased advertising of drugs, some healthy people are convinced that they require drugs to keep them healthy! It's up to individuals to educate themselves, and to be aware that the bottom line, and not healthy consumers, may be behind the push in drug advertising that now pervades television and print resources. You can keep yourself informed through a website called Healthy Skepticism. According to the site, "Healthy Skepticism is an international non-profit organisation for health professionals and everyone with an interest in improving health. Our main aim is to improve health by reducing harm from misleading drug promotion." You can also visit the library and look at some of our books on the pharmaceutical industry. Here's one to get you started: Generation Rx: How Prescription Drugs are Altering American Lives, Minds, and Bodies by Greg Critser [338.4761 CRI]. Or, you can read up on the Food and Drug Administration, the governmental department that is supposed to be guarding your health, in Protecting America's Health: The FDA, Business, and One Hundred Years of Regulation by Philip J. Hilts [353.9 HIL]. ...it just so happens to be one of my favorite fruits, but that aside, a co-worker has been touting the wonders of grapefruit as a metabolism booster. The grapefruit diet has been around, in one form or another, for many years. The trouble with a grapefruit diet, though, is it is not a realistic approach to eating. People don't normally eat grapefruit 3 times a day! People are always looking for the one diet that will let them drop pounds quickly and will keep the weight off. That's why the bestseller lists always have at least one diet book on them year round. Cruise, Jorge. The 3-Hour Diet: How Low-Carb Diets Make You Fat and Timing Makes You Slim. Cunningham, Tricia. The Reverse Diet: Lose 20, 50, 100 Pounds or More by Eating Dinner for Breakfast and Breakfast for Dinner. Greene, Bob. The Best Life Diet. Hyman, Mark. UltraMetabolism: The Simple Plan for Automatic Weight Loss. Reames, Robert. Make Over Your Metabolism. Thurmond, Michael. The 6-Day Body Makeover: Drop One Whole Dress or Pant Size in Just 6 Days--And Keep It Off. Young, Lisa R. The Portion Teller: Smartsize Your Way to Permanent Weight Loss. Please note: I am not endorsing any of the diet plans listed! Here's my reducing diet advice: eat less, eat a variety of foods, exercise a lot more than you have been! Reducing diets are nothing new, people have been turning to them for at least 200 years! Marjolijn Bijlefeld's The Encyclopedia of Diet Fads [613.25 BIJ] covers a number of them. 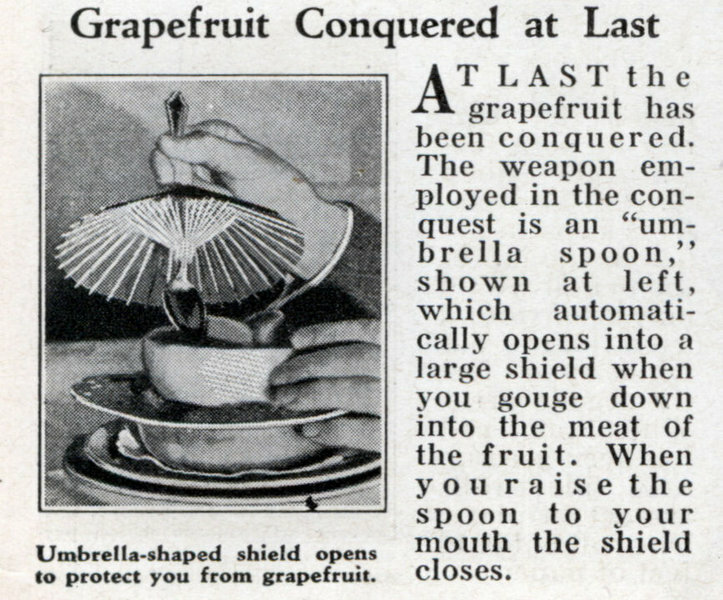 The grapefruit diet is briefly discussed here. Another outstanding workshop I attended was "Cemetery Quest: Using burial grounds to teach and share local history" with Steven Glazer of Valley Quest, a program of Vital Communities. Okay, so I'm a little warped--I happen to like cemeteries! This workshop, however, was more than a look at historical burial grounds. It showed how a community, or a region such as the Connecticut River valley, can discover its local historical resources and share them with its citizens. It sounds like something that would be good to pursue here in Windham. How many people know about Windham's history? Probably a small number of the adults in town, and an even smaller number of its children. A "Discovery Quest" is developed for a location. In many cases, the quest is put together by a teacher and a class who are studying local history. Quite simply, a quest is a treasure hunt. The "treasure," a small box containing a sign-in book and a special stamp, is found by reading maps and following clues. But of course, the real treasure is finding out about the people and places in the community. I purchased Valley Quest II: 75 More Treasure Hunts in the Upper Valley for our collection. It has been cataloged [917.4 VAL] and is nearly ready to go! I think it would be a resource for teachers and local groups who are interested in replicating the program for our area. As those who've taken the Windham Historical Society's "mystery tour" know, there are many interesting places right here in town. (We keep two copies of the tour information from past years, one in our Reference section [R 974.2 WIN], and the other on the regular shelves [974.2 WIN].) I will be ordering Steve Glazer's book, Questing: A Guide to Creating Community Treasure Hunts shortly. I hope someone in the community will borrow it, and Valley Quest II, and realize that it's time for a Discovery Quest program to be started right here in southern NH! Anyone willing to take on the challenge? If you have an interest in New England cemeteries, make sure you visit A Very Grave Matter. One I did manage to attend was the "Great Stone Face Tea." I didn't get any tea, but I got some great suggestions of books to read! The winner of the 2007 Great Stone Face Book Award, picked by the children of NH (grades 4 to 6), was announced. Drum roll please... The Ghost's Grave by Peg Kehret [J KEH]. Auch, M.J. One-Handed Catch [on order]. I heard M.J. read a chapter at a retreat. It is outstanding. This talented writer, of everything from dancing chickens to the Triangle Shirtwaist Factory Fire of 1911, was able to take a potentially gruesome scene and make us all laugh despite ourselves. I won't reveal the scene, you'll have to read the book for yourself. Duble, Kathleen Benner. The Sacrifice [on order]. Duble, a local writer (Andover, MA), discovered members of her family were once accused of witchcraft. Duble also found out that there were more people accused of witchcraft in Andover, than there were in Salem, MA! I bet you didn't know that--I didn't! Lord, Cynthia. Rules [J LOR, also in audio J AB/CD LOR]. This book also won a Newbery Honor Award. One of the characters is a child with autism. I loved the book The Curious Incident of the Dog in the Night-Time by Mark Haddon [F HAD]. That book's main character had autism, too, and I'm looking forward to comparing the two books. Cynthia Lord hails from Maine. 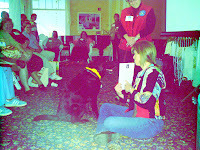 Another of the workshops I attended was "Reading Dogs" with Hawke, a black lab, and her trainer Barb Burri. Hawke is part of Therapy Dogs International's (TDI), "Children Reading to Dogs" program, and has been certified as a reading dog. Hawke visits the Plaistow and Atkinson public libraries where she listens to children reading. She is currently working on the trick, "look," so that when children point to a picture in a book, Hawke will put her nose near it and appear to be looking. I'm not really a dog person (what kitty is? ), but I fell in love with Hawke. Her patience seems endless, and her joy was obvious to us all! "Children are introduced to the wonderful, magical world of books in a positive and unique way. In no time at all the reading skills of most children will improve without stress." It looks like I'll have to have a part 3! Check back tomorrow. This year's conference was fantastic! I participated in the presentation of a new book discussion kit service (READS-TO-GO) put together by the Reference and Adults Services (READS) section of NHLA. Book discussion groups have sprung up all over the state, and, finding enough books to keep these groups satisfied, has often fallen upon the interlibrary loan librarian in public libraries. What READS has done is to develop a kit format that makes it easier to borrow multiple copies of a requested title. READS provides sturdy canvas bags, a list of discussable titles ("hot" new titles like The Memory Keeper's Daughter [F EDW] or Water for Elephants [F GRU]), discussion questions, and other materials. Libraries, friends groups, book clubs, etc. volunteer to purchase 15 titles of a book from the list (one may be a large print edition if LP is available). The kits are then made accessible through the state interlibrary loan system. It's a win-win situation for everyone! 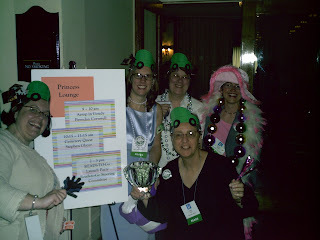 The committee formed to develop the program was quite excited by what we came up with, so we decided to announce it to NH library community through a "launch party" at the conference. Appropriately, we were scheduled for the "Princess Room." From the photo above, you can see that normally sedate librarians were tranformed into walking advertisements! The luncheon speaker on Thursday, was children's writer and illustrator, Judy Schachner. Schachner showed slides and her presentation style was down-to-earth and humorous. If you haven't come across her Ladybug Award winning book, Skippyjon Jones [JP SCH], then visit the library and borrow it today! While you're there, look for some of her other titles, too, [all JP SCH]--Skippyjon Jones Color Crazy, Skippyjon Jones in the Dog House, The Grannyman. Don't miss Schachner's biography for a real taste of this talented woman, and to learn about her family of Vikings! Tomorrow I'll post more notes on the conference! 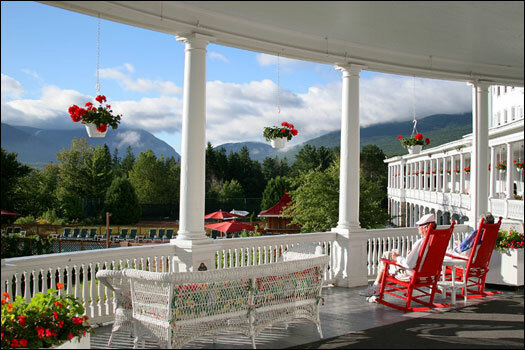 The NH Library Association and the NH Educational Media Association are holding their joint annual conference at the Mount Washington Hotel in Bretton Woods. What a fabulous location--it's almost a shame to have to spend the time indoors at the workshops! The hotel has a long history that has been featured on NHPTV, and it's "return to glory" was the subject of an article in UNH Magazine. For a history of the region, you can view the VHS, Mount Washington: An Early History: 1852-1908 [974.2 MOU]. And Then There Was One: A History of the Hotels of the Summit and the West Side of Mt. Washington by George E. McEvoy [974.2 MCA] covers the hotel industry in the region. New Hampshire was a great destination for city dwellers who wanted to escape the heat in the summers before the invention of the air conditioner! For those who could afford it, the entire summer may have been spent at one of the grand hotels. I'm a fan of the "Images of America" series put out by Arcadia Publishing. Each title is chocky-block full of old photos, most taken by residents of the area covered. One of the titles is White Mountain: Hotels, Inns, and Taverns by David Emerson [974.2 EME]. I might take it along to peruse while I sit in a rocker on the porch between workshops! 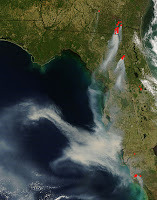 Fires in Georgia and Florida have recently made the news. These fires destroyed hundreds of thousands of acres of woodlands. Now we're hearing of wildfires raging in New Jersey! This is only the beginning of what will certainly be a summer of infernos! Unless NH gets an adequate amount of rain this year, we may be faced with devastating fires of our own. Fortunately, NH has developed a plan, outlined by NH Fire Lookout Historian, Iris W. Baird in Looking Out for Our Forests: The Evolution of a Plan to Protect New Hampshire's Woodlands from Fire [974.2 BAI]. For an illustrated history of NH's firetowers, consult Baird's A Field Guide to New Hampshire Firetowers [974.2 BAI]. For a fun and educational outing with the kids, visit the Museum of New Hampshire History in Concord where you will have the opportunity to climb into a replica of a firetower and view the city! As a Nesmith Library card holder, you can reserve a pass to the Museum. If, like me, your knowledge of opera is limited to Elmer Fudd's take-off of Wagner's "Ride of the Valkyries," you may want to take the plunge and borrow one or two of our new audio books that are part of the "Black Dog Opera Series." For example, there's Giacomo Puccini's La Boheme [AB/CD PUC]. In the three disk package, disk one is devoted to background information such as an act and scene synopsis, as well as biographical information on the performers. The other two disks contain the complete opera for you to enjoy. Other titles include Bizet's Carmen [AB/CD BIZ] and The Marriage of Figaro by Mozart [AB/CD MOZ]. Speaking of Elmer Fudd, you can see him at his melodic best in "What's Opera, Doc?" Enjoy! Imagine our surprise at Sunday's Red Sox game when a hawk suddenly appeared! He rode the thermals up above the bleachers and then was gone. Did you know that hawks migrate? 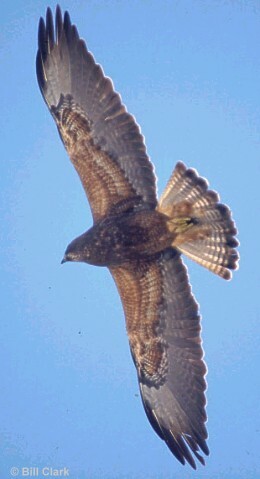 The Hawk Migration Association of North America can provide more information if you're interested. If you'd like to view the migration over New Hampshire next fall, check out the information provided by NH Audubon. They Done Their Mamas Proud! My youngest kitty, Gretchen, got us tickets for the Mother's Day Red Sox game. What a fun time! From the Remdawgs, to the liquid refreshment, to the weather, to the final score, it was a great day! The Sox really done their mamas proud! The first 8 innings were a bust. Baltimore led 5 to 0. In the ninth inning, however, Boston turned everything around! The game ended with the score 6 to 5! To those who left early I have this to say, "Nyah, nyah, nyah, nyah, nyah!" If you've ever wondered how to get your lawn mowed with those wonderful Fenway outfield patterns, then we've got a book for you: Picture Perfect: Mowing Techniques for Lawns, Landscapes, and Sports by David R. Mellor [635.9642 MEL]. This guide was written by Fenway Park's groundskeeper! Mellor also gives general lawn advice in, The Lawn Bible: How to Keep It Green, Groomed, and Growing Every Season of the Year [635.9647 MEL]. 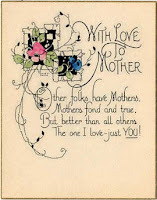 Queen Noor picked up on Howe's message and yesterday made her own plea for a Mother's Day of Peace. Good for her! There are dogs who are trained to read with children in schools and libraries! These companion animals provide a patient listener for children who may have difficulty in reading. It's a wonderful idea, don't you think? 1.) 2007 is the 70th anniversary of SPAM (the luncheon meat)! To celebrate, you might want to watch the Monty Python skit, found on our Monty Python's Flying Circus collection [DVD MON] ("SPAM" is on DVD #8). 2.) Have you seen our belly dance video, Flex Appeal: A Belly Dance Workout [DVD 613.71 FLE]? As exercise, belly dance has many benefits, and, if you can do it without having fun, then there's something wrong with you! Those who get into belly dancing usually get into the accouterments, too. This site was recommended to me by a NH librarian (not all librarians fall into the stereotypical mold). 4.) On April 24, I spoke about weddings and brides. I neglected to mention at the time, that there is a way to put old wedding outfits to good use--National Wedding Dress Day! The first one was held last year in the U.K. People (women AND men) wore dresses to work, or around town, and collected money for their favorite charities. 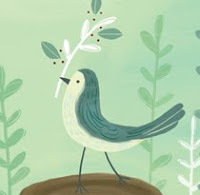 This year, one librarian is trying to bring the celebration over here! I'd gladly participate in such a fun celebration, but, since I last wore a wedding dress, I've added a few pounds! 5.) I'm not sure if this fundraising effort would be suitable for the Nesmith Library! When traveling I always consider a library to be a treasure--if not for the items on the shelves, at least for the clean bathrooms! The site, www.waymarking.com, "will provide you with the tools to share and discover unique and interesting locations on the planet." Members list places that may be of interest to other geo-cachers. Waymarking is another example of social networking that is available online, probably the most famous being MySpace. But back to libraries as treasure...I found that someone has been listing NH libraries on the Waymarking site. I hope to see us on there one day! Hey, we have great bathrooms! To learn more about GPS, look for GPS for Dummies by Joel McNamera [629.045 MCN]. And to learn about geo-caching, visit the Official Global GPS Cache Hunt Site. Saturday, I attended my first ballgame of the season--the NH Fisher Cats vs. the Bowie Baysox. (In case you didn't know, Bowie is in Maryland. I had to look it up!) The game started at 1:05, and although we got there by 12:10, we were still too late for a Curt Schilling bobblehead! We were bummed, but we recovered enough to enjoy the Fisher Cats win 3 to 1. It was a great game and a perfect day to be outdoors as you can see in the photos! Next month, on Friday the 29th at 7:05 pm, we'll be having Nesmith Library Day at the ballpark. The Fisher Cats will be playing against the New Britain Rock Cats. We have a block of tickets that we will be selling at the front desk starting on May 15. For $11.00 you will get a seat (there are no bad seats in the stadium) plus the "Hot Diggity Dog" package (a hotdog, bag of chips, and a soda). The first 2000 people through the gate will get a David Ortiz bobblehead. If you can't make the June game, we'll be doing another Nesmith Library Day on Saturday, August 25, at 7:05 pm. The ticket prices are the same and will go on sale mid-July. 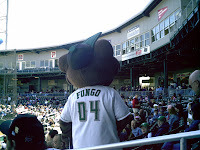 The Fisher Cats will be playing the Portland Sea Dogs. The game will be followed by the Atlas Fireworks show. 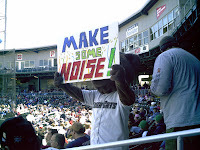 Swinging for the Majors: Inside the New Hampshire Fisher Cats Championship Season by Michael Cousineau [796.35764 COU] will give you a taste of what it is like to play on Manchester's minor league team. Minor league baseball is also covered in the children's book, The Not-So-Minor Leagues by Douglas Gay [J 796.357 GAY]. 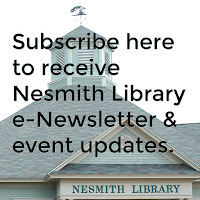 Do your reading this month, and you'll be all ready for Nesmith Library Day next month! A couple of weeks ago, I had to fold a ring using a dollar bill. I found the directions and then practiced until I perfected it. It took many tries, and, several hours of my life! I felt pretty good about myself having done it right. Imagine my shock to see the April 2007 issue of Muse magazine [J MAG MUS] with a paper folded dragon complete with claws and scales! An article called "War of the Origami Bugs," told of a physicist, Dr. Robert Lang, who developed a computer generated program to map the folds for many complex origami figures. The most amazing part of the article revealed that the dragon on the cover was folded without the aid of computer directions! The accomplished paper folder is a young (20 years old at the time) Japanese man, Satoshi Kamiya. The 8" dragon took 40 hours to fold! And, if you ever feel a need to fold a ring or a bowtie out of a dollar bill, look for The Buck Book by Anne Akers Johnson [J 736 JOH]. I'm sure you've heard that this is the 400th anniversary of the start of the first permanent British settlement in Jamestown, Virginia. 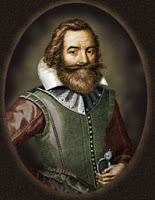 Jamestown is famous for the legend of Pocahontas and Captain John Smith. Anyone who has seen the Disney version of Pocahontas [J DVD POC], knows that some liberties were taken with the story! So what is the real story? I'm sure no one knows for certain, but writers have been trying to unravel the mystery for years. Paul Aron's Unsolved Mysteries of American History: An Eye-opening Journey through 500 Years of Discoveries, Disappearances, and Baffling Events [973 ARO] covers the topic in a chapter called, "Did Pocahontas Save John Smith?" Even the accounts of eyewitnesses must be taken with a grain of salt. I don't know how many meetings I've sat through, and then, after reading the minutes, wondered if I and the secretary were at the same meeting! But, if you want to read an eyewitness account of the Jamestown settlement, we have The Writings of Captain John Smith; With Other Narratives of Roanoke, Jamestown, and the First English Settlements of America [975.502 SMI]. It might be fun to read Smith's account and then to read the work of a biographer such as Dorothy Hoobler, who wrote Captain John Smith: Jamestown and the Birth of the American Dream [B SMI] and compare the two. 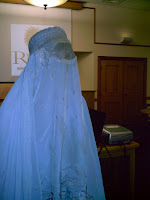 Last evening we had a fabulous program here at the library on Afghanistan and the women of Afghan. Rachel Lehr's powerpoint presentation opened a few eyes to the hardships most of the world's population faces on a daily basis. Clothes are much more than simple coverings for our body! Modern life in America has presented some sad stories for us to ponder. Take Lionel Carter. Carter, 89 years of age, was interviewed on All Things Considered. It seems that thieves had targeted him and his amazing collection of 50,000 baseball cards. A collection of this size can't be kept at the home of the collector--Carter mentioned that a safety deposit box would not be big enough! Rather than put his, and his wife's, home and lives at risk, Carter put the collection up for sale. He is not keeping track of the auction results because he's not interested in the money, only the cards. His life-long hobby has come to an end--too sad... To learn more about Carter and the auction, read the press release from the auction house. Do you have a collection of baseball cards? How many of us clothes pinned cards to our bicycle spokes to make a cool flappy noise and now say, "How I wish I had those cards"? If your collection is intact, check out the 2007 Standard Catalog of Baseball Cards [769.497 STA] and look up some of the values. Baseball cards have provided a "portal" for a time travel series for kids by Dan Gutman called "A Baseball Card Adventure." We have several titles in the series in our children's room, including Honus and Me [J GUT], in which 12-year-old Joe Stoshack finds a 1909 Honus Wagner card and ends up traveling back in time to meet Wagner and picking up a few baseball pointers as well!